This flavorful and symbolic herb is a favorite in global cuisine, but it's also enjoyed for its antibacterial and anti-inflammatory properties. Basil has been one of the most popular plants used by humans for centuries. Archeologists believe basil was first cultivated as a food crop approximately 5,000 years ago, possibly near or in Western India. Throughout the centuries, basil's soothing aroma, distinguished flavor, and medicinal prowess turned it into one of the most beloved culinary herbs. Nowadays, it remains a staple ingredient in many ethnic cuisines. Relieving indigestion. The carminative properties of basil make it ideal for relieving flatulence and stomach discomfort. Healing gastric infections and food poisoning. Basil has numerous antimicrobial properties, which help relieve gastric issues, from gastritis to food poisoning. Improving stomach flu. Basil is known for alleviating symptoms of gastroenteritis. Stopping hiccups. Although not corroborated by science, it is believed that basil essential oil can halt the involuntary, spasmodic contractions of the diaphragm that close the throat and produce hiccups. Reducing blood sugar levels. Because of its hypoglycemic properties, basil can lower blood sugar levels. Preventing blood clots. With its anticoagulant properties, basil can help prevent the formation of blood clots. The vast variety of basil medicinal uses lies in its essential oil, which is made up from a combination of approximately 80 different compounds, being the most notable ones eugenol, menthol, limonene, and anethole, which provide anti-inflammatory, cooling, antiseptic, and antibiotic action to basil herbal remedies. 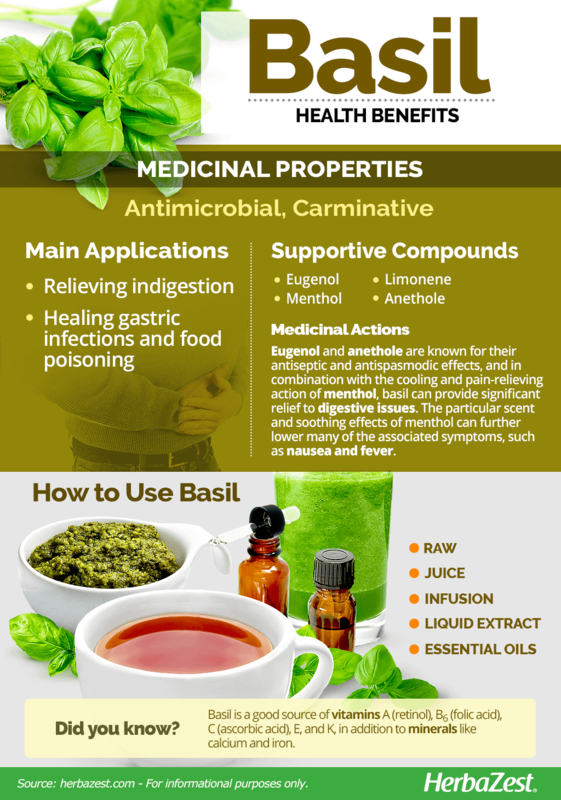 Although basil's exact mechanism of action is yet to be fully understood, due the high number of compounds involved, eugenol and anethole are known for their antiseptic and antispasmodic effects, and in combination with the cooling and pain-relieving action of menthol, basil can provide significant relief to digestive issues. The particular scent and soothing effects of menthol can further lower many of the associated symptoms, such as nausea and fever. The nutritional value of basil is remarkable as well: it is touted as a source of vitamins A (retinol), B6 (folic acid), C (ascorbic acid), E, and K, in addition to minerals like calcium and iron. Antimicrobial properties are also present in meadowsweet and thyme, whereas dill and fennel provide similar carminative benefits. Consuming basil is likely safe in most instances, especially in its culinary form. However, basil does contain estragole, a chemical compound which can lead to liver damage when consumed in excess. Due to its hypoglycemic properties, those who suffer from diabetes should exercise caution when consuming basil because it can lower blood sugar levels. Basil also acts as an anticoagulant, so consuming basil before surgery or when taking certain blood pressure medications is not recommended. Children should also limit their basil intake because it contains estragole. Women who are pregnant or breastfeeding should also limit their basil intake due to the presence of estragole. Raw. Whether fresh or dried, basil leaves are typically consumed in salads, or as a flavor enhancer for many other dishes, such as pizza or pesto sauce. When consumed in this form, basil can relieve indigestion and flatulence. Infusion. A basil hot tea offer numerous medicinal effects. It can alleviate flatulence, heal gastric infections, and prevent blood clots. Juice. In this form, basil can aid digestion and lower blood sugar levels. Unlike its Indian relative, holy basil, sweet basil is rarely used in remedial or supplemental forms. Basil extract is employed as a flavoring agent in culinary preparations, and basil essential oil is popular in aromatherapy, due to its refreshing and energizing aroma. Basil is easy to find in most grocery stores or local markets around the world. The most common form of basil is as unwashed leaves. Basil dried seeds and leaves are readily available through online retailers. Basil supplements are not widely available; however, basil extracts, mostly used for flavoring, can be found online, as well as basil essential oil, which is popular in aromatherapy. Sweet basil (Ocimum basilicum) should not be confused with its relative holy basil (Ocimum tenuiflorum), which is commonly found in herbal remedies and supplemental forms. Native to tropical regions, basil grows best in sunny, warm climates with approximately 6-8 hours of sunlight per day. Under such ideal conditions, some cultivars of basil can behave as perennials, although any exposure to frost or harsh temperatures will cause it to behave as an annual. The ideal temperature for germination is 68°F (20°C) while growing temperatures can range from 45 - 8°F (7 - 27°C). Basil is susceptible to frost and cold temperatures, so it is important that it is exposed to full sunlight in order to thrive. It is important to water basil regularly, since it does not tolerate drought-like conditions very well. Basil requires well-drained, fertile soils in order to grow. Because basil has deep roots and is vulnerable to invasive weeds, mulching the soil surrounding it is recommended. Basil seeds should be sown six to twelve inches (15 - 30 cm) apart. Basil is vulnerable to slugs, beetles, leafminers, caterpillas, and grasshoppers, so minor pest control is recommended in order to keep this herb healthy. Basil is vulnerable to certain species of fungi, including Rhizoctonia solani, Pythium spp. and Phytophthora spp. Detailed information about growing basil can be found in the herb garden section. Sweet basil has square stems, two-lipped flowers and abundant fragrance oil-bearing glands that is typical of the Lamiaecae family. 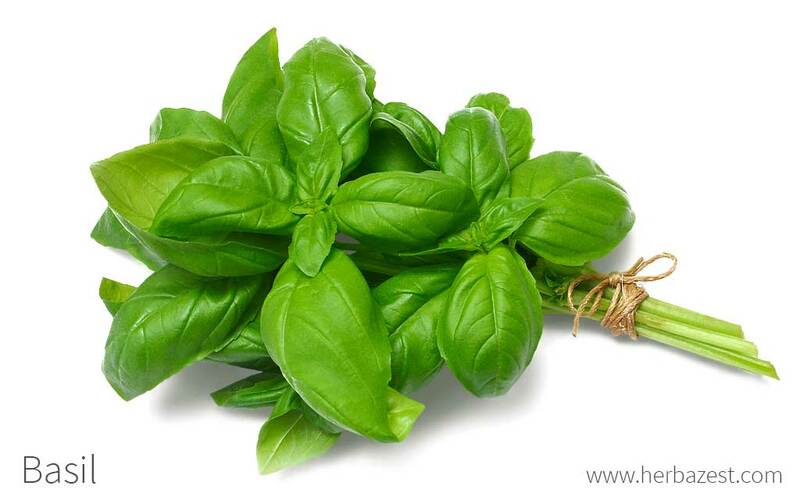 Basil is a member of the Lamiaecae or mint family, which is characterized by its members' fragrant leaves and contains over 7,200 species, most notably peppermint (Mentha x piperita), rosemary (Rosmarinus officinalis), sage (Salvia officinalis), oregano (Origanum vulgare), thyme (Thymus vulgaris), and lavender (Lavandula officinalis). Sweet basil's botanical name, Ocicum basilicum, derives from the Greek okimon (smell) and basilikon (royal). Sweet basil (Ocimum basilicum) has two close relatives: holy basil (Ocimum tenuiflorum) and lemon basil (Ocimum xcitriodorum). However, sweet basil is the most common type of basil cultivated. Two popular varieties of sweet basil are Thai basil (O. basilicum var. thyrsiflora), which is used in Asian cooking, and lemon basil (Ocimum var. citriodorum), white-flowered and smaller-leaved, with a pronounced citrus fragrance. Originally native to southerneast Asia and the South Pacific islands, basil is believed to has been first domesticated over 5,000 years ago in West India, where it was considered a sacred plant. Traces of its history can be found in numerous texts across Europe dating as far back as Ancient Greece during the reign of Alexander the Great. Basil made its way to England in the 16th century and to the Americas in the 17th century. Basil is an important economic crop, used widely for both its culinary and medicinal uses. The United States, France, and the Mediterranean region are currently the largest producers of basil. This herb produces 100 tons of essential oil worldwide every year, and the basil industry is worth around $15 million USD annually. In its native India, the leaves were used in courtrooms for the accused to swear their oath on. In Italy, Mexico, and Romania, basil branches were given from men to women as a symbol of their love. One of the most infamous superstitions of the 16th century was considering basil as a poisonous herb, due to its inability to grow in the presence of rue. Some physicians even believed that by simply smelling basil, scorpions would grow in the brain. Basil's essential oil is very toxic to mosquitoes, acting as both a repellent and as poison to their eggs. Additionally, because it is a low maintenance and hearty herb, many amateur gardeners like to plant basil in their herb gardens. Germplasm Resources Information, Taxon: Ocimum basilicum L.